By Susan Hunt and Barbara Thompson. 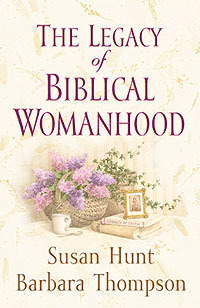 Whose responsibility is it to disciple women in the biblical image of womanhood? Hunt and Thompson believe this important job belongs to the church---and offer practical advice on starting a "spiritual mothering" ministry in your congregation. Discover the joy that comes from "passing the baton" of faithfulness to the next generation! 240 pages, soft cover from Crossway Books. 3 to 6 questions at the end of each chapter.